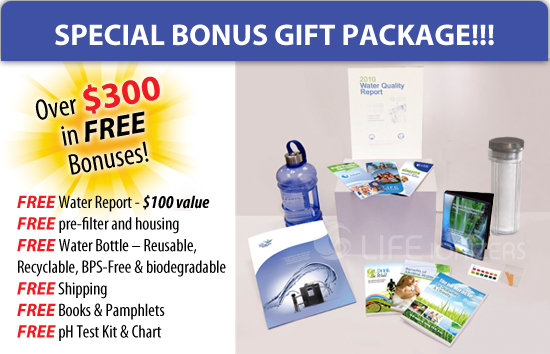 Click the button below to add the 9200 Life Alkaline Mineral Water Ionizer - Under Counter to your wish list. SMPS - Power source that replaces old fashioned transformer. Same high tech electrical system that powers High Definition Television. SMPS energy efficient power conversion in water ionizers produces better quality water and extends system life. The LIFE 9200 is the industry standard for under-counter water ionizers. As the under-counter version of the popular LIFE 9100, this under-sink ionizer gives you the ultimate in ionization technology while maintaining the integrity of your kitchen design. Therefore, the only part of the ionizer you will see on your countertop is the beautiful brushed stainless steel faucet! This revolutionary ionizer allows you to enjoy the same high efficiency, advanced filtration, and quality of alkaline water that so many people have come to love with the LIFE 9100. Plus over $300 in Free Bonuses! Over the years LIFE Ionizers has proven to be the industry leader in advanced ionization technology. With the LIFE 9200 you have the freedom to choose between solid or mesh plates. You also have the ability to add all of the most advanced features available only from LIFE Ionizers such as UV Light disinfection, Energy Frequency Technology, and Vitamin C filtration. This unit also comes standard with LIFE Ionizers advanced filtration to ensure that you are getting the cleanest and most healthy water available! The LIFE 9200 contains the ability to be taken out from under your sink and used as a standard counter top unit. This is very beneficial for those who wish to travel and still enjoy the benefits of alkaline water. This process is easy to perform and the machine will connect directly in to most sink faucets. This is just another example of why LIFE Ionizers leads the way in ionizer innovation technology. Our new LIFE Ionizer interior water filter uses an all natural dechlorinating medium that neutralizes chlorine & most chloramines from your drinking water. With the LIFE Ionizer Vitamin C filter you get the best of both worlds. Perfect chlorine removal PLUS any benefits that may stem from being exposed to one of Earth's most powerful antioxidants - Vitamin C! It's not only about what we take out of your water, but how we do it that separates the LIFE Ionizer filter from traditional filters. At LIFE Ionizers we believe in providing you with protection from any type of chlorine found in your drinking water. In order for you to fully appreciate the benefits of utilizing Vitamin C to dechlorinate your drinking water, you must first understand the potential dangers related to Chloramine and chlorine exposure. The very presence of these toxic chemicals in our public water supplies is a real threat to our well being and overall health. Free chlorine, aka chlorine, is used the world over to disinfect the public's water supplies. It is well documented that it has the ability to seek out and destroy harmful disease causing organisms and has provided us with a relatively safe water supply. But chlorine also has a negative side that many have experienced firsthand. Its ability to neutralize deadly organisms in our drinking water also creates problems when we expose ourselves to this toxic gas. Chlorine does not distinguish between bad organisms and good ones, when we expose ourselves to it then it continues to attack the healthy cells within our bodies. This exposure to chlorine over a period of time has generated health related cases, many of which have been directly linked to the exposure to chlorine. The anti-oxidant molecule of Vitamin C effectively converts a free radical molecule of chlorine into a harmless chloride by the process of a simple electron transfer. This stops the free radicals found in chlorinated water from creating a chain reaction when they come into contact with our skin. The anti-oxidant Vitamin C makes itself available for energetically favorable oxidation. Most oxidants such as the hydroxyl radical (as seen with KDF), contain an unpaired electron damaging to humans and plants at the molecular level because they are highly reactive. This is due to their interaction with proteins, lipids and nucleic acid... Reactive oxygen species take electrons from (oxidize) Vitamin C first to monodehydroascorbate and then dehydroascorbate. The oxidized forms of Vitamin C are relatively stable and non reactive, and do not cause cellular damage while the reactive oxygen species are reduced to water. MESH Technology™ increases the surface time the water spends on the plates. This causes an increase of the electrical charge within the water, therefore, boosting the pH and ORP of the water by 5% to 10%. LIFE Water Ionizers with MESH™ delivers an electrical current to the water through an array of positively and negatively charged Platinum coated Titanium plates. The more the water passes in and out of the Titanium grid system (MESH™) and the greater the electrical charge to the water (especially when powered by the newer SMPS power systems) - the higher the pH (potential of Hydrogen) and the ORP (Oxidation-Reduction Potential) of the drinking water. UV (ultraviolet) light is a form of electromagnetic radiation that can kill viruses and bacteria, providing an additional layer of protection for your water. Ultraviolet disinfection of water is a chemical-free process that utilizes radiation to inactivate microorganisms. The radiation destroys the genetic information contained in the DNA, so the bacteria lose their reproductive capability and are destroyed. Even parasites resistant to chemical disinfectants, such as Cryptosporidia or Giardia, are efficiently reduced by UV light. 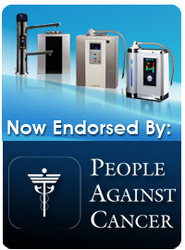 LIFE Ionizers™ are the only ionizers available that offer UV Light Technology™. To ensure the maximum number of microorganisms are destroyed, we pass the water through a 9-stage filtration process before exposing it to UV light. This filtration removes large particles from the water, maximizing light transmittance through the water, increasing the UV dose, and ensuring that microorganisms are not shielded from the radiation. Filtration also ensures that the light source stays clear and strong. In fact, we guarantee our LIFE Ionizers™ with UV Light Technology™ will deliver UV light in doses high enough to effectively purify your water for a full five years. Life Ionizers has acquired a proprietary technology called Energy Frequency Technology™. This trade-secret technology generates and encodes 205 potentially health-building energetic frequencies using techniques derived from quantum physics. This means that your water is more than just purified and ionized—it's energized! Healing energy can access the body via the body's own electromagnetic field. The healing effects of subtle electromagnetic energies can also be carried around the body by the hemoglobin in blood, since oxyhaemoglobin is diamagnetic and deoxyhaemoglobin is paramagnetic. Healing energy can also be carried around the body by magnetizing iron in blood, using an ionic current created by the electrolytes in the plasma, using proteins to serve as semi-conductors, via nerves, via connective tissue and by using water. The human body consists of approximately 70% water. Many biologically active compounds are switched on or off by changes in the concentrations of dissolved ions in water such as sodium and potassium. Individual water molecules, with their tendency to form hydrogen bonds, also stabilize the structure of proteins, whose action depends crucially on their shape. A Life water ionizer optimizes these principles by creating the best pH, -ORP, molecular structure and energetic properties of your water. In the 1920s Linus Pauling first pointed out that at the heart of the covalent hydrogen bond is resonance (frequencies). Since the hydrogen bond is an integral part of water molecules, enzymes, DNA, all food substances etc., it follows that if healing energy affects this bond it will be able to influence every part of the body. Also, George Lakhovsky discovered in 1935 that individual cells have two characteristics – capacitance and inductance – which are also elements of a tuned circuit like a radio receiver. Robert Becker has shown that the shape and size of different cells is dictated by minute electric currents, which are in turn dictated by the bio-magnetic field of the body. This all relates to healing energy frequencies which are thought to produce tiny healing eddy currents in your body's tissue. Water is said to have a memory for negative frequencies that are generated by toxic impurities like fluoride, arsenic, lead and 1000’s of other contaminants. Bio-resonant laser technology is used to erase negative frequencies from water and reprogram it with healing frequencies. Bio-resonant Blue Laser Technology uses informational frequencies to erase negative frequencies and program it with healing frequencies. Boosting the energy content of water is believed to help counteract disorder and stress in the body. Energetic drain on a cellular level can lead to poor overall health. Healing frequencies provided by bio-resonant laser technology help align the body’s subtle energetic systems, the means by which all cells communicate. When the body’s subtle energy fields are in balance, its internal healing mechanisms are activated. Health comes naturally to the body that is energetically balanced. A Bio-resonant Laser charges water with scalar energy. The charged water, when drank, transfers that energy cells in the body. Clinical testing of unhealthy cells revealed that they have a very low energy level, about 15 – 20 millivolts. After treatment with a scalar energy, those same cells reached a 70 – 90 millivolts energy level, which is the normal range for healthy cells. Laser water reprogramming is used to restore water to its original state, and reverse the harmful energies built up by chemicals and processing. When you restore your drinking water to its natural healthy state, it can help restore you to your natural healthy state. A step-by-step instructional video on installing your Life Ionizer 9200.